Americans have a longstanding attraction to the romanticism of the French capital, Paris. Since the 19th century creatives have been migrating to Paris to achieve greater importance in cultural fields—writers such Gertrude Stein, F. Scott Fitzgerald, Ernest Hemingway arrived in the 1920s; the abstract expressionists and pop artists descended upon the city in the 1950s and 1960s; more recently, fashion designers Thom Browne and Rick Owens established their business and received critical acclaim there. There has been a further influx of American fashion designers this couture week. Among them is Rodarte—perhaps my favourite American label—designed by sister act Laura and Kate Mulleavy, hailing from the sun-drenched West Coast. It was an unexpected and surprising move on their part, as the New York Times reports they have only two French stockists. However, justifying the decampment, the Mulleavy sisters said it was about a creative proposition and aligning themselves closer to couture, where they feel their business truly belongs. 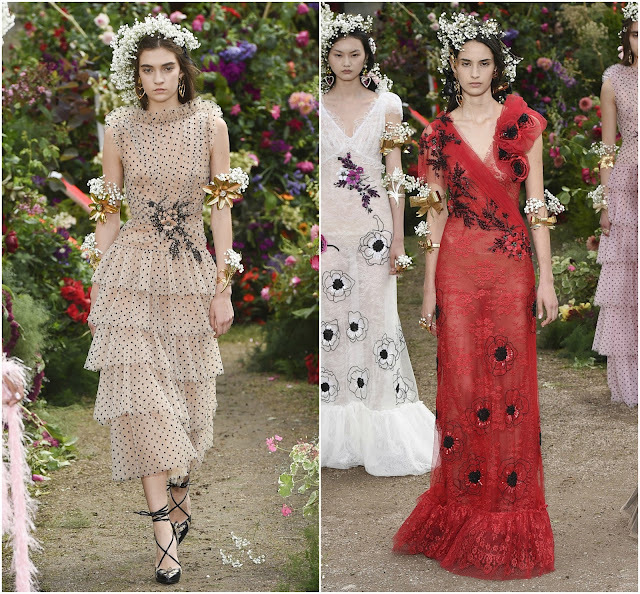 Despite competition from couture behemoths such as Chanel, Dior and Valentino, the sisters aren’t deterred—their business is characterised by its personable approach to craftsmanship and they’re concerned with craft and not becoming the next Chanel, Dior or Valentino; their current state is satisfactory, although growth is certainly in their mind somewhere. 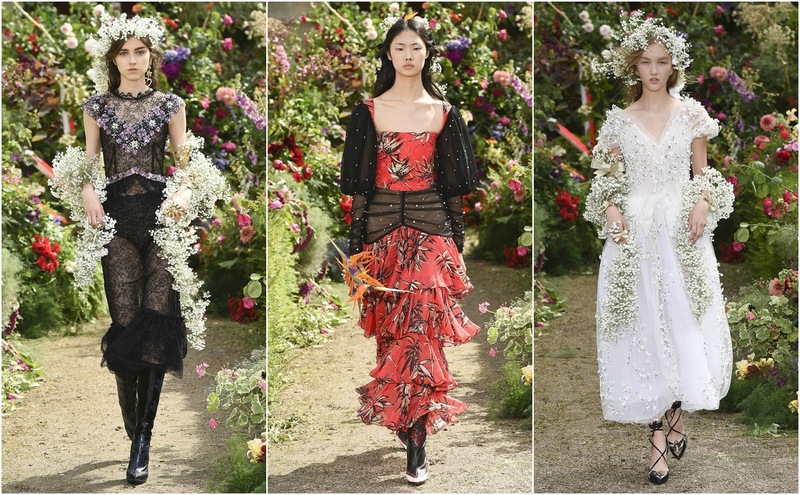 One could forgivably be deterred from the sea of frothy tulle and shimmering sequins and glittering embroideries that dominate the couture schedule, but unforgivable is the refusal to devour the might and beauty of a Rodarte show. At Port Royal, 16th century cloisters, the models led a procession that culminated in the flowery courtyard (courtesy of production design company Bureau de Betak). There were classic Rodarte-isms, ones sorely missed from February, when they opted out of New York Fashion Week. 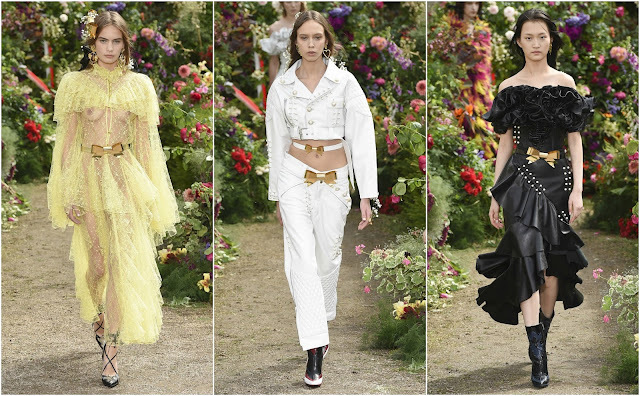 They merged tweeness with a darker, Western-tinged, Victoriana-inspired perspective—a black leather, studded boiler suit with quilted legs and gold ribbon-accented belt, accessorised with a helping of baby’s breath; beauty isn’t straightforward at Rodarte. Their complex vision of beauty—albeit beauty nonetheless—is what distinguishes them from the Chanels and Diors of the world. Their approach is organic and refute the manufactured hubris of their conglomerate counterparts. In short, if Chanel and Dior are the roses the über rich plant in their lush gardens, Rodarte is the alluring wild flower found in close proximity to the road’s edge. Perhaps the most enchanting gown was the finale—a vermilion, floor-sweeping concoction laced with ruby entrustment and with floral etchings. It had all the components of a Rodarte dress: it was otherworldly, beguiling and compellingly enchanting… bubbling under the surface is an indescribable weirdness, there’s something off. Is it the contrast of stark black and oddly warm vermilion? Perhaps it could be the additional decoration, a look replete with baby’s breath. The mystery is enticing.